JRA members Daniel Collins, Mark Thomasson and Annie Hill have compiled a mast specifications database from data members entered in their membership profiles. You can download this Excel spreadsheet here. Of course any database is only as good as the data entered into it. Daniel, Mark and Annie did their best, but neither they nor the JRA can warrant its accuracy. Nedal Aluminum - sells a wide variety of extrusions and 'lighting columns' (tapered poles.). The 'Boulevard' model is suitable for mast-making. Peter Scandling reported (August 2013) that "Lighting Supplies in Sterling can supply an 11.6 m aluminium tapered pole for £450, 200 mm at the base and 76 mm at the top, wall thickness 3.3 mm all the way up." Paul Fay reported (August 2013) that "... street lamp post manufacturer Fabricat who are in Nottingham make tapered lamp posts and are happy to alter them for use as masts. The masts on our Ti Gitu were made by them and although it took a while for them to be processed through their system the end results are great. Nice taper - additional straight section at the base - hot dip galvanised and then painted. We are really pleased with them. If you need any more info my number is on the Fay Marine website"
A Generic Spartite equivalent - Wally Bryant of s/v Stella Blue describes a mast re-sealing job in exhaustive detail using a lcost-effective solution. Alan Boswell of Boswell YachtDesign, the designer behind Sunbird Yachts and Sunbird Marine Services and latterly head of design for Oyster Marine is returning to the freelance life. Alan has designed over 250 junk rigs for conversions of existing boats. Contact boswellyachtdesign.com or at The Corn Barn, Shotley Hall Barns, Church Walk, Shotley, Ipswich, IP9 1DN, UK, Tel +44 (0) 1473 788790. 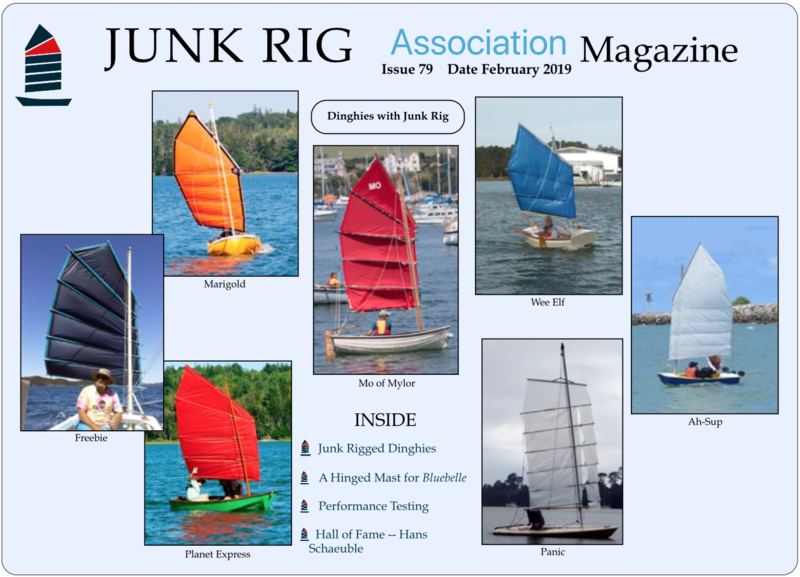 Our database of boats which have been rigged or converted to junk rig, compiled by Georg Warnecke and updated by Alan Boswell, can be found here. If you know of any boat missing from this list, please let Alan, or the webmatser, or both know so that we can keep this list up to date. Sailrite - Sailcloth, Sunbrella, tapes, sewing machines, notions. Sebastian's site now has a section in English. Sebastian speaks and writes English well. He and his mate Nora are known for their grand JR Sloop Peregrine. Dabbler Sails Sole proprietorship with experience of making junk sails. Tad Roberts, says member Daniel Collins, is "an excellent and deeply knowledgeable 'junkie' with many talents including boat and sail design." Tad designed the rig for Dan's Aletheina, our Boat of the Month August 2013.